The investor is not required to have any prior business experience. Likewise, the investor is not required to demonstrate any minimum level of education. The only requirement for the investor is that he or she has the required net worth and capital. No. An investor should obtain the services of a translator (friend, attorney, family member) to read our fund materials and contact our office for more information. Can I apply if I have been rejected or terminated in the past by USCIS for a L-1, B, or other visa? Rejection in the past does not disqualify the applicant, unless the reasons are related to immigration fraud or other major problems. It is most important that all criminal, medical, or U.S. immigration history problems be disclosed to the Fund and legal counsel in advance of your petition. Yes. You must submit to and pass a health screening as part of the Consular review process before a conditional EB-5 Visa is granted. What is meant by the requirement that the investor’s assets be “lawfully gained”? Under USCIS regulations, the investor must demonstrate that his assets were gained in a lawful manner. This requires the investor to prove his investment funds were obtained through lawful business, salary, investments, property sales, inheritance, gift, loan, or other lawful means. Yes, however a bona fide gift from a family member should be properly documented and any applicable taxes must be paid. What issue caused the most problem when applying for an EB-5 visa? Do I need a U.S. immigration lawyer to process my EB-5 petition? Yes. You will need a qualified immigration attorney familiar with the USCIS EB-5 visa petition process to represent you. While YKARC will provide you with supporting documentation for your EB-5 petition related to the regional center and your investment in the Fund, it cannot provide legal advice. The EB-5 visa petition process is the responsibility of you and your immigration attorney. You are responsible for all legal fees and costs associated with preparing and processing your EB-5 visa petition. How much do I have to invest to meet the EB-5 Program requirements? The EB-5 Program regulations require that you invest a minimum of US$1,000,000 and be engaged in the management of a “new commercial enterprise” that produces at least 10 new jobs. You may, however, invest as little as US$500,000 if you invest in a new commercial enterprise located within a targeted employment area, or TEA. TEA’s are defined as any area that has experienced a rate of unemployment greater than 150% of the national average. What are the obligations of the investor to participate in the investment? The EB-5 regulations require involvement in management or policy making. The regulations deem a limited partner in a limited partnership, which is properly structured and that conforms to the Uniform Limited Partnership Act as sufficiently engaged in the EB-5 enterprise. As a limited partner, the investor may continue to engage in his own business, live where he pleases, and enter and exit the United States without any obligation to manage the investment. Most importantly, the limited partner, like the corporate shareholder, is only liable to the enterprise to the extent of the agreed-upon investment. This business structure protects the investor. What is the likely return on my $500,000 of capital? Individuals interested in learning about projected returns, expenses and revenues are invited to review the YK America Regional Center business opportunity overview. The law states that the $500,000 must be “at risk”, and that providing a guaranteed minimum return and/or a guaranteed return of investment funds does not meet the requirements of the law and is expressly prohibited. There are specific risk factors for each limited partnership, which are included in the offering materials for the limited partnership. Risk factors differ for each partnership but general risks include economic conditions, failure to meet job requirement and denied immigration status under the USCIS EB-5 Immigrant Visa Program. A limited partnership is a business organization with one or more general partners, who manage the business and assume legal debts and obligations, and one or more limited partners, who are liable only to the extent of their investments. Limited partners also enjoy rights to the partnership’s cash flow, but are not liable for company obligations. The USCIS requires that some financial risk be involved so we cannot guarantee the return, but we do make all best efforts to minimize the amount of risk by making sure that the investment is properly collateralized and that the partnership is in strong financial standing. YKARC recommends investment opportunities to a partnership only after an extensive financial and project review. What is Conditional Permanent Residence (CPR)? Under the regulations, an investor who is approved for the EB-5 immigrant visa receives a “conditional” green card, which is valid for a two year period. A “unconditional” or permanent green card has no expiration date, otherwise the two cards offer the same rights and privileges. The investor, spouse and any unmarried children under the age of 21 at the time of the I-526 petition. It is possible for adopted children to be included in the family. Do I have to stay in the U.S. once I receive my EB-5 visa? No. As a permanent U.S. resident, you will be able to travel freely within and outside of the United States, the same as any citizen. 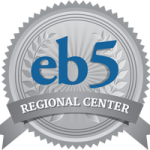 The USCIS EB-5 regional center program has the added advantage that you may be a passive investor – you are not required to work in or actively mange your investment. You should enter the United States within 180 days of being issued a visa and establish residency (for example by opening bank accounts, obtaining a driver’s license or social security number, paying state and federal income taxes, renting or buying a home). Thereafter, you may continue to live and work abroad but should re-enter the U.S. no less than once every six months. Will my children be able to remain in school in the U.S. if I leave the U.S.?